This retreat is an opportunity to immerse yourself in the illumination of Amoda’s teachings. Her invitation is for you to discover what is deeper than the reactivity of the ego, to dive into the immovable core of your true nature, and then to commit to moving from that unwavering presence in response to your world. Through dialogue, inquiry, and radical self-honesty, we will investigate how we can lovingly expose this reactivity and then relax into our inner core in all circumstances. In the safe container of this gathering, everything that is experienced is a doorway to transformation. While the theme is "unwavering presence", ultimately it is about love .. the kind of love that is the deepest knowing in your heart, and the kind of love that is the openness of your natural state. The retreat is suitable for all, whether you are a newcomer to Amoda’s teachings or more familiar with her work. Discourse, Q&A, Inquiry (2 to 3 sessions a day). Time for contemplation, integration, and relaxation. There will be time in the early morning (before breakfast) for movement practice - Yoga/Pranayama classes are offered by the Mount Madonna Center teachers. These are optional and you are also welcome to follow your own yoga or meditation practice at this time. Please note - although not officially a "silent retreat", you will be invited to keep silence throughout (apart from the Daily Sessions in which you are invited into inquiry/Q&As). The aim is to put aside social chit-chat to see what is here in a deeper dimension of being. There will also be formal "silent sitting" (silent meditation) sessions include daily. For those who are sharing a room with a friend or wish to walk or share a meal with a friend, the silence is not strict but we ask that you keep an attitude of respect and quietude. We can provide “In Silence” badges for those who wish to be in complete silence. There are plenty of places at Mount Madonna Center for both solitude and interaction, according to your preference. Vedic Temple offering a Ceremony of Light twice daily. Breakfast, lunch and dinner are served daily - these meals are vegetarian, using only fresh, high quality ingredients, organic and local whenever possible, and lovingly prepared. Ample protein choices (tofu, beans, cheese, etc) will be included. Gluten-free and dairy-free options are also available at each meal. Additional food sensitivities/special requirements can be requested in the retreat booking form, and we will do our best to accommodate you. Indian Chai is served at each breakfast, along with coffee and tea. Teas, coffee, water & fruit are available at break times. A wide range of gourmet coffee drinks and other delicious snacks are available for purchase at Anjaneya's World Cafe. Double or single room with shared bathroom. Double or single room with private bathroom. 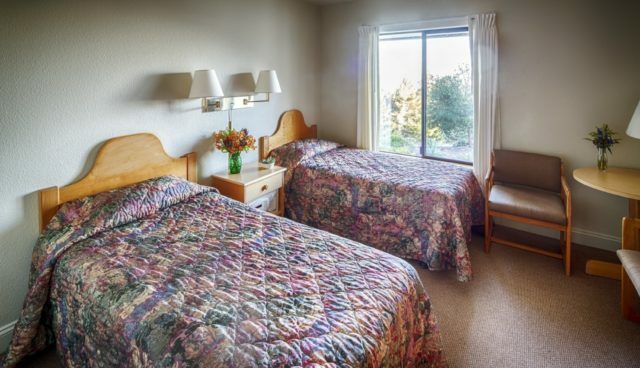 All beds are single size and the rooms are hotel-style, most of them with windows facing Monterey Bay. Please note - there is limited availability for single room with private bathroom. If this option is no longer shown in the ticket form below, we suggest you reserve either a double with private bathroom or a single with shared bathroom. If you choose a shared bathroom, these are located very close to each room (just down the hallway) with separate bathrooms for women and men. These are used only by retreat participants and so are still relatively private. If you have any questions about reserving a room - or absolutely require a single with private bathroom - please contact us here. We sometimes have changes to the room availability and we will do our best to accommodate your needs. Camping (bring your own tent) and RV; you will need to bring your own bedding. Enclosed shower and outhouses are close by. We know it's a long list, but PLEASE READ IT CAREFULLY! 1. Please make sure you read through all the information about lodging carefully. If you are unsure which room will suit you best, please contact us here before making your reservation. 2. Make sure you let us know (using the booking form) if you wish to share a room with someone specific - this is especially important if you are sharing a double room with a friend or are in a couple. 3. Please note that only ONE person per booking form is possible. If you are booking as a couple, you will need to purchase two separate tickets (and let us know that you will be sharing a room on the booking form). 4. If you are a snorer, please consider booking a single room. 5. Mount Madonna Center will do its best to accommodate food sensitivities and special requirements, but please note that they cannot cater for individual tastes. Gluten and dairy-free options will be available at every meal, as well as ample supplies of protein in the form of tofu, yoghurt, cottage cheese, nuts, vegetables. All meals are vegetarian and no processed foods are used. 6. You will need to bring your own towels. There are also inexpensive towels to purchase at the center if you need to. All bedding is provided. 7. You will be sent a welcome email with a list of what we suggest you bring and other details before the start of the retreat. No refunds after October 12th. Prior to Oct 12, refund can be issued minus a $100 administration fee. If you need to transfer your ticket to someone else because you cannot attend, there is a $50 administration fee. There are no transfers possible after October 22. Tuition Fee is $495 - the ticket fees shown below include the lodging and meal costs for each room type plus the tuition fee. Mount Madonna is located on sacred ground with 355 acres of redwood groves, hiking trails and meadows infused with a sense of peace and spaciousness and heartfelt service. The Center is supported by the Hanuman Fellowship originally founded to support the teachings of Baba Hari Das in the 1970’s. Today it is a bright, modern retreat & conference center offering a serene and magical space for transformation, community and study. Our retreat will take place in the Maple Room, an annex of the main Conference Center. By air - the closest airport is San Jose (SJC) which is about a one-hour drive from the center (43 miles). San Francisco (SFO) and Oakland (OAK) are both about 1.5 hours away (74 miles). Here is a list of private shuttle options, if you require travel from the airport to the center. Any questions prior to booking, email us here and we will do our best to assist you!